pCO sistema is the CAREL solution for managing HVAC/R applications and systems, the result of continual improvements in more than 25 years’ experience in the sector. It consists of programmable controllers, user interfaces, electronic expansion valves, inverters with DC technology and communication interfaces, remote management systems to offer OEMs working in HVAC/R a control system that is powerful yet flexible, can be easily interfaced to the most widely- used Building Management Systems. A complete solution made-to-measure for the new generation of high efficiency units: chillers, air-conditioners, heat pumps, shelter units, rooftop units, compressor racks and air handling units. It is easily modifiable, so as to differentiate air-conditioning and refrigeration units in terms of both appearance and functions. A range of sizes is available, according to the number and type of inputs and outputs and the use of the built- in terminal. Plastic cases with DIN rail mounting guarantee high mechanical protection of the board and can also host a built-in user interface. The inputs and outputs are separated in the layout to simplifying wiring. 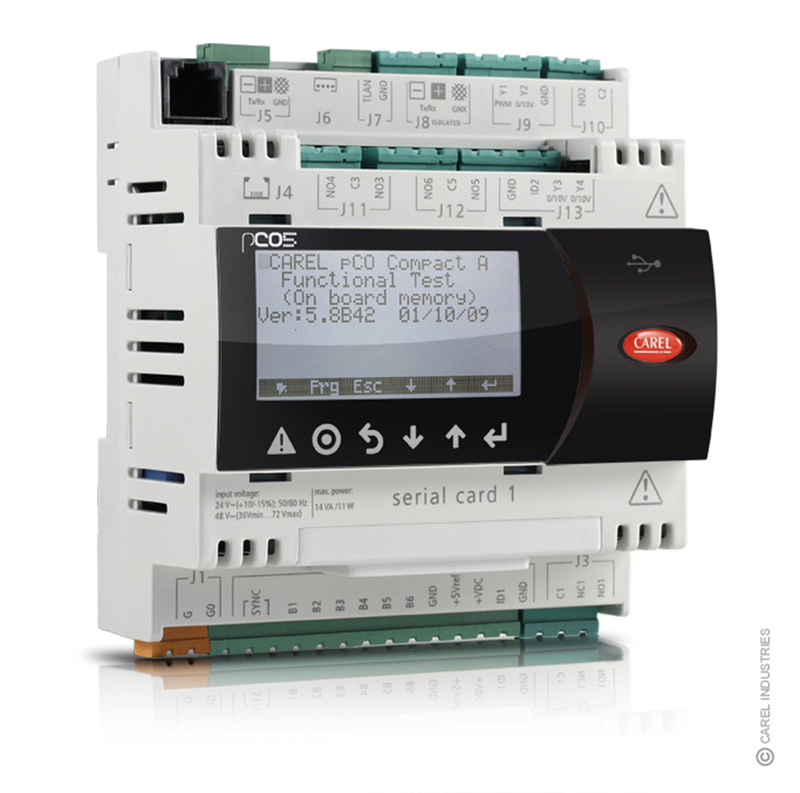 Interfaces: The pCO series terminals are available in semi-graphic and graphic alphanumeric LCD versions to display messages. To allow complete yet simple access to all the information on such advanced and high performance systems, pCO sistema offers a new range of user interfaces with the latest generation touch screen technology. Technology: A 32-bit microprocessor guarantees high program execution speed, controlling even fast transients. Large memory space available means trends in temperature, pressure, unit status, etc. or events such as alarms, can be saved over long periods. Communication: pCO sistema can interface with the most commonly-used communication standards, such as Modbus® BACnet™, SNMP, LonWorks®, Konnex® and Johnson METASYS®. All pCO sistema components can be connected to pLAN networks, so as to exchange data and information. Serial communication can also be used to control smart actuators, such as EC fans, variable flow-rate pumps, etc., allowing complete system integration and management. All further increasing the level of performance and system reliability. Finally, remote access to the system allows innovative remote control and maintenance services, as well as very useful functions for end users, such as control of home systems via mobile phone.